The Mulder Shipyard in Holland has come a long way since its roots more than 75 years ago, but that progress has been measured and carefully considered. As a result, the 30m Mulder 98 Flybridge – the largest the yard has launched to date – is packed with experience and careful development. The result is impressive – a well-finished yacht with a high quality interior and solid performance in testing North Sea conditions. In addition, the monitoring of her weight throughout the build has meant she performs above target while still showing the enormous flexibility the yard can offer a client during the build itself. With her traditional lines and family DNA in both her design and her build, this Mulder 98 Flybridge impresses from all angles. Impressive seakeeping abilities, great flybridge deck space, a sumptuous but unfussy interior design and four comfortable owner/guest cabins make this an appealing proposition for anyone after a solid, reliable pocket superyacht. The client specified several additional elements through the build, including a Rational steam oven in the professional stainless galley that also required the yard to adapt the generators and systems installation during the build. In spite of their relatively small size, the whole of the Mulder range is built in aluminium and the Mulder 98 Flybridge is no exception. “We are not so fond of GRP,” Mulder explains. “I think aluminium is the most beautiful material to build a boat with.” While the hull is subcontracted to another Dutch company, the rest of the fit-out – including carpentry, electrical and mechanical installation – is handled in-house. The new yard that has been specially designed for efficiency means that the trades and services are right next to the build itself. Guido de Groot has drawn the lines for many Mulder models and with the 98 the family DNA is continued. “The exterior design doesn’t allow for extreme beam,” de Groot says, “as she is a more traditional design. You deal with the proportions that go with her lines.” Her high topsides include a style line in the aft bulwark, while her relatively low profile, single-deck design allows her to remain sleek and in proportion. The client expressed a love for the work of Frank Laupman at Omega Architects, and Laupman was brought in to finalise the interior style. The predominant wood is stained walnut, offset against brushed nickel banding, wools, linens, silks and leathers, with Tai Ping carpets adding a sumptuous luxury to the contemporary chic theme. 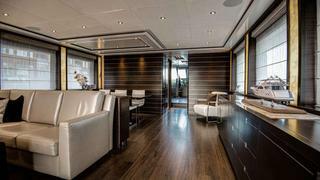 The layout comprises a main deck saloon with forward dining area (enhanced by backlit honey onyx panels in the window mullions), with a full beam midships master suite on the lower deck along with a forward VIP and two additional guest cabins. 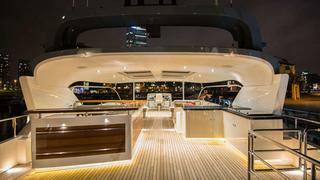 A professional, stainless galley lies to port on the main deck, with the wheelhouse forward. Crew are located aft in comfortable quarters. A generous main aft deck and a foredeck that features a drop-down table that forms a large sunpad are complemented by a large flybridge/sundeck. 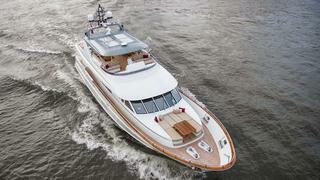 “The sundeck was fully customised to the owner’s wishes,” de Groot explains. 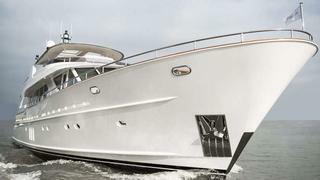 “We produced various options including one with a spa pool, but this is what the owner wanted – a clear aft area with a tender crane to port, a long hardtop with four windows, a grill to starboard, a bar to port, and twin dining areas either side.” Forward seating and a central flybridge helm complete the upper deck. 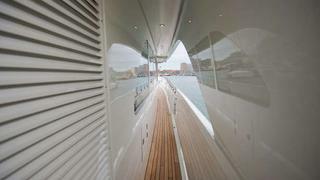 With no garage aft, the tender is carried aft on the sundeck or on the swim platform. The mechanical installation is superb, and in fact Ginton Naval Architects designed the hull around the propellers and shafts to maximise efficiency while minimising noise and vibration. Her round-bilge hull offers semi-planing speeds of up to 22 knots – two knots over contract – while the careful prop design combines with semi-hidden half-tunnels in the hull and a Venturi-effect underwater exhaust system to deliver smooth power with minimal noise intrusion for guests. In our trials, facing 28 knots of wind and a short, steep sea, she performed admirably. Her gyro stabilisers allowed some roll in quartering seas which can help to mitigate seasickness but her directional stability was unaffected by the conditions. Heading into the wind, she maintained a comfortable 12 knots into the chop with the bow design mitigating any slamming. She is a fine sea boat.